So you have a big dinner party coming up, and you really want to impress your guests? Apple pie from scratch too difficult? (who has time to create the universe these days?) This recipe for a delicious Planet can be scaled to fit any crowd and the planet is as much a conversation piece as a culinary treat. Beginning with a molecular cloud is the traditional way to make a planet. Although it involves more preparation, some cooks swear by it. Others prefer the convenience of a pre-made star and accretion disk, available at your local star forming region. If you choose to begin with a star and disk, you may skip the next paragraph. If you begin with a molecular cloud, the first thing that you will want to do is check its stability. If the cloud is stable, it is not going to form any stars until you destabilize it. The shockwave from a supernova will quickly destabilize your cloud, and has the added benefit of providing metals heavier than iron, such as gold, lead and uranium, as well as some of the rarer light isotopes. I find that these improve the flavor significantly. If supernovae are not in season or are otherwise unavailable, bright stars can provide enough of a push with their stellar winds to destabilize your cloud. Once the cloud is destabilized, wait ~100,000 to 1 million years for stars to form. When stars begin to form, choose one with an accretion disk containing significant mass in the form of gas and dust. Click to view the UK Astrophysical Fluids Facility site, which has excellent images and videos of a molecular cloud collapsing to form many stars suitable for this recipe. Now that you have a star with an accretion disk, you will need to decide what type of planet you want to form. It is suggested that less experienced cooks prepare a terrestrial planet, because the steps involved are less time-critical. If you are serving a large crowd, are aiming to make a big impression, or are up for a challenge, then a gas giant is the planet for you. This recipe will often create several of each type, so depending on your goals, you may or may not want to discard any extra planets formed. To begin with, the process for making both types of planet is very similar. Begin by stirring the accretion disk so that grains of solid material begin to collide and stick together. If you are creating a giant planet, you will want to do this farther from the star so that you have ice as well as rock and metal to form your planetesimals. If you are creating a terrestrial planet, you will want to work a little bit closer to the star so that it is not watered down by all that ice. As you stir, the small grains should clump to form aggregates, similar to dust bunnies. Take care as you stir that collisions between these aggregates do not smash them into smaller pieces. They should continue to grow until their own self-gravity begins to make them round. At this point you should have billions of asteroid-sized pieces. This will occur more quickly if you are working beyond the frost line. Continue to stir, and watch as even larger clumps grow. Now you should notice that the larger clumps are growing faster than the smaller ones, due to their extra gravity and larger cross section. This is known as “runaway growth” and is key to the planet formation process. This stage should last between 10,000 and 100,000 years. When the mixture has formed relatively evenly spaced ~1000 km planetary embryos you may stop stirring. These large planetesimals will continue to accrete the remaining small objects in the disk for another ~100,000 years. The result should be a system of large moon-mars sized objects. Now let the system stand for 10 to 100 millions years. Do not be alarmed if the star’s stellar wind clears away the gas from the inner system as it stands. The gas is not needed unless you are creating a giant planet. Your planetary embryos will perturb each other gravitationally, and many will be expelled from the system. Others will undergo massive collisions. All of this is natural and is to be expected. Our own planet suffered an impact with an object the size of Mars which blasted a large amount of rock into orbit. This rock eventually coalesced into our moon. 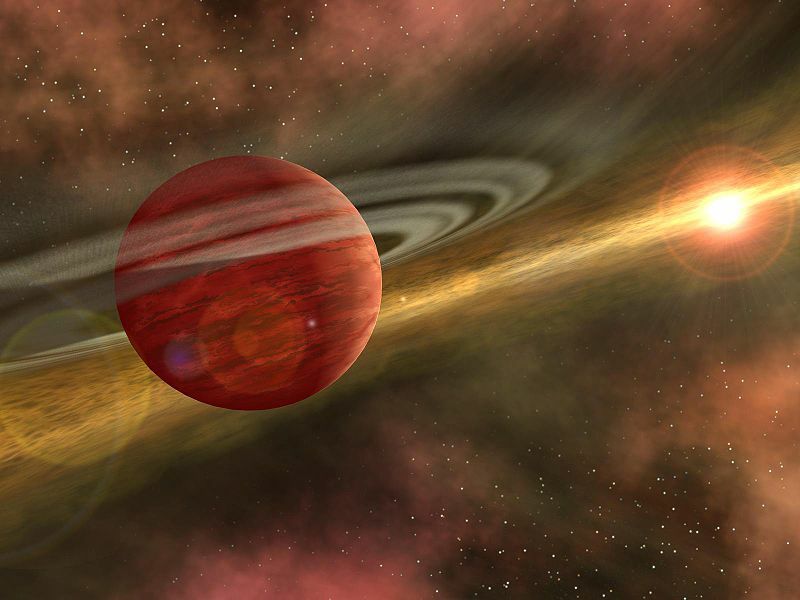 So, although the process seems violent, it is an important step in forming planets. If you are making a terrestrial planet, congratulations! You are finished! Set the planet aside and allow to cool. Planet will thicken as it stands. Serve when it reaches the desired consistency. If you are making a giant planet, you will have a large icy and rock body, several times the size of a terrestrial planet. The entire process should happen much more rapidly if you are working beyond the frost line, with large planetary embryos forming in ~10 million years. Skip the merger stage, since there are unlikely to be very many large bodies so far from the star. If you have prepared the planet properly, you will form the core while there is still a significant amount of gas in the disk. Allow the rocky/icy core to accumulate gas due to its large mass. Eventually your giant planet will self-limit its growth by consuming all of the gas in the nearby disk. You may see a gap in the disk where your giant planet has formed. The very skillful cook will end up with a giant planet that has accumulated a significant gaseous atmosphere. 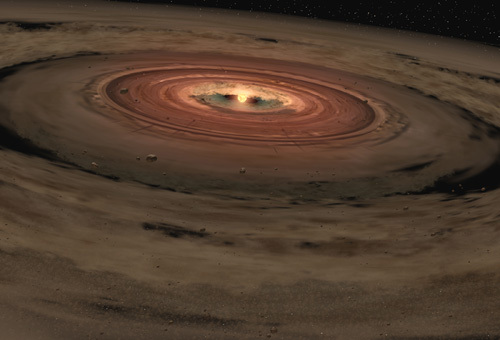 It may even form its own accretion disk, with small moons forming in a manner similar to terrestrial planet formation. 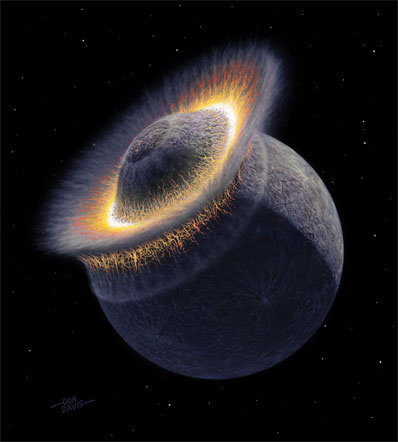 These moons are considered a special delicacy to planetary scientists and are the mark of a well-made giant planet. Other cooks will suggest that giant planets may be formed by creating instabilities in the gaseous accretion disk that spontaneously collapse. Although this sometimes works, it can often form brown dwarfs or larger objects, and I find that when it does form planets they are less appetizing than those formed via accretion. Allow your giant planet to cool before serving. It will not thicken, but should decrease dramatically in size. It may develop dramatic windy jets and colorful storms, depending upon its composition and distance from the star. Crush an icy moon and use it to garnish the planet with rings, if desired. As will all recipes, successfully creating a planet with the desired properties is not an exact science. Do not get discouraged if your planet does not turn out the way you wanted on your first try! There are many factors that can affect the process, and you will do best to experiment with slight modifications. I encourage you to post suggestions and comments to help future cooks come up with the best planets possible! This entry was posted on July 14, 2008 at 1:56 am and is filed under exoplanets, Fun Stuff, Not Mars, Planets in General. You can subscribe via RSS 2.0 feed to this post's comments. Both comments and pings are currently closed. What if we added 1/3 part alcohol gas? I would like to make a Earth-like planet the size of Jupiter or Saturn. Is that not possible or how would I go about forming such a massive terrestial planet.